In the first of our insight series, we look to our reviews to tell us how consumers see the shape of key financial products in 2015. 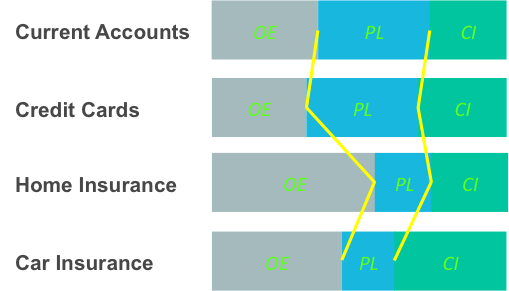 To better understand and visualise this, we’ve utilised the Value Disciplines Model, and focused on the following four banking and insurance products: current accounts, credit cards, car insurance and home insurance. Consumers are increasingly seeing differences between the various organisations they do business with and the products that they hold with them. How far this picture is also reflective of the way product owners want consumers to think about their products is a question many organisations are asking. To what extent the renewed focus on innovation in the fields of product leadership and customer intimacy will impact the shape of financial services over the coming years remains to be seen. However, when we juxtapose the shape of each product with the individual profile of some higher performing products, we can see that there is compelling case for further innovation across the market. Next week we’ll share our hierarchy of banking needs in 2015. We’ll also predict what this will look like by 2020. Please share our insight series with your colleagues. If you have any feedback or ideas for future topics tell us by clicking here. Want to subscribe? Click here. Smart Money People has a unique pulse on the financial services industry. Our customer insight spans a cross-section of financial organisations and includes quantitative and qualitative performance and regulatory insight at scale. 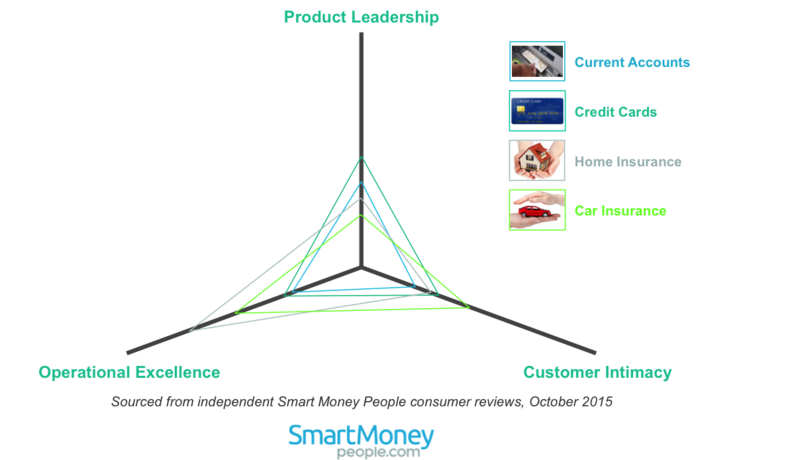 Smart Money People Insights is a ten part series designed to share this insight in bite-sized chunks. We’ve looked across our most reviewed banking and insurance products and analysed these to see how consumers perceive these financial products. The in scope review population totalled 2,011. You can be part of our insight by writing a review too. 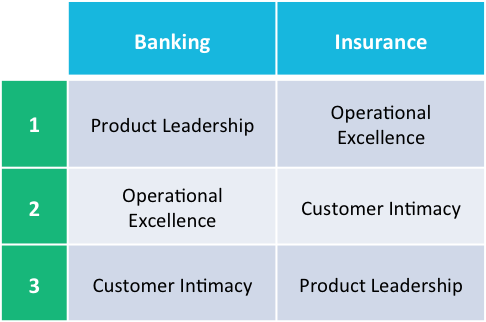 The value disciplines model states that there are three key value disciplines for companies: Operational Excellence, Product Leadership and Customer Intimacy. Companies must choose one of the value disciplines and act upon it consistently. While this doesn’t mean that the other two dimensions don’t matter, it signifies that being ‘ok’ is enough. While not without its critics, its application in the above case has helped to analyse our reviews and better structure our consumer reviews.